Growing up between beach towns on the Jersey Shore was pretty special. Our AIM profiles bragged, "our lives are your vacation," as we spent countless hours working on our tans in the sand over the summers. In high school, I frequently found myself watching the ocean waves instead of paying attention in Physics. While I was the absolute slowest person on the track team (no exaggeration), I enjoyed running on the boardwalk with the ocean breeze in my hair. But what I've always loved most about the boardwalk is the food. I haven't been to the Ocean City boardwalk in a number of years as I've grown quite accustomed to the neighborhood firepit instead. But when I was home for Thanksgiving, I got quite a craving for the boards of my youth. There are only a few stores here and there open in the off-season, but luckily, they're all the best ones. When I was younger, and for a number of years before then (since the 1950s), this place was called Mack & Manco's so that's what I'll refer to it as forever outside of this post. Manco & Manco is more than just your classic boardwalk pizzeria. This place works like a machine. It's best to sit at the counter, grab the special (2 slices and a soda for $6.25), and watch the show. The men behind the counter knead and flatten two squares of dough together, spin the pie up in the air, scatter tons of cheese on the dough adding a spiral of tomato sauce fresh from a hose, before popping it into the oven. Slices are served piping hot, so you'll definitely burn your tongue on the first slice. Only tourists get toppings, don't mess with the classic plain. 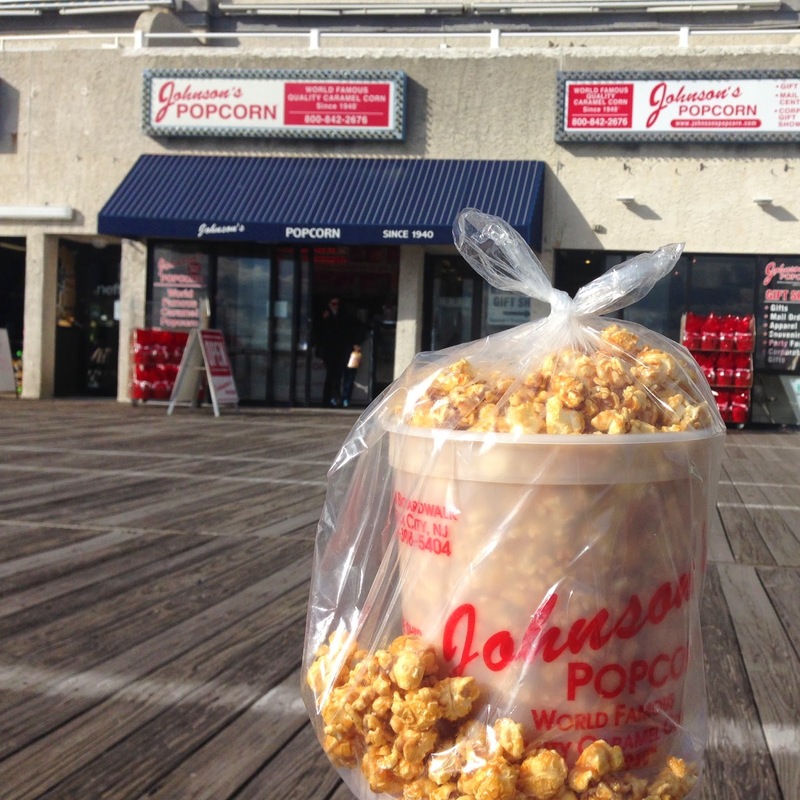 Johnson's Popcorn has been around in Ocean City even longer than Manco's & Manco's, since 1940. It's classic caramel corn but it's about 1000 times better than that stuff you used to get during the holidays in the giant can with the three parts for caramel, cheddar, and regular popcorn. You know what I'm talking about. You can get this popcorn in an open bag to eat (for $4 or $7) while you're strolling the boards but a much better value is the tub for $8. If you're not saving it, ask for it open to fit in an extra few spoonfuls of popcorn. If you purchase it sealed, it will stay good for a few months. But why would you wait to eat it?! The best part about this popcorn is when you tell yourself "okay, only one more piece" after you've been gorging on it for a while, you can always find a piece that is actually 6 or 7 pieces melted together. It still counts as one. Salt Water Taffy is a staple of the Jersey Shore and Fralinger's is said to be the original, with a history that dates back to 1885. The name of Salt Water Taffy is said to come from when the waves washed over a candy stand and soaked all of the candy there, which the disgruntled owner called "Salt Water Taffy" that day. The original Fralinger's is in Atlantic City. I have been enjoying Salt Water Taffy for years, but just discovered the chocolate-covered taffy Fralinger's offers on this last visit. It's definitely a nice twist as banana, raspberry, peanut butter, mint, and orange go fantastically with chocolate. I also made it out of there with a few adorable "sea air and sunshine-filled" boxes of the classic taffy to share with my coworkers this week, if there is any left tomorrow. I have a sugar-consumption problem. I was a little disheartened that Kohr Bros. was not one of the classic stores open. Kohrs' is a Coney Island original that has been on the Jersey Shore for decades and has expanded to Key West, Virginia Beach, the less cool Ocean City in Maryland, and more. I suppose it would have been too cold to eat their peanut butter and chocolate custard on a cone on a brisk day in November. Maybe I will venture off from the wedding I'm going to in VA Beach in a few weeks in search of this treasure. Until then, more popcorn and taffy!